Once leaving the Lesser Kestrels, we plan to visit an abandoned village situated between corn fields, poppy fields and dry lagoons. This small village is falling in ruins, and several bird species, usually cavity nesters, are living and breeding among this chaos. But the first visible animals are rabbits! Numerous small rabbits are running along the ruined walls, rushing into their holes while we are walking through the ghost village. 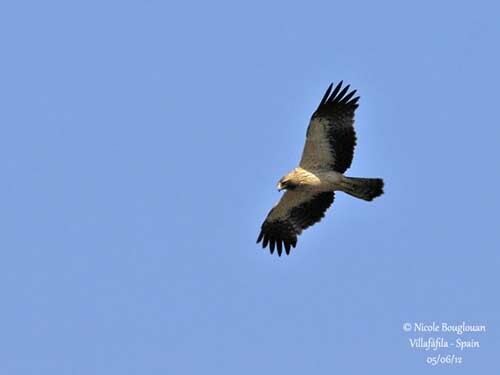 Their conspicuous presence explains the frequent passages of the Booted Eagle (Hieraaetus pennatus). 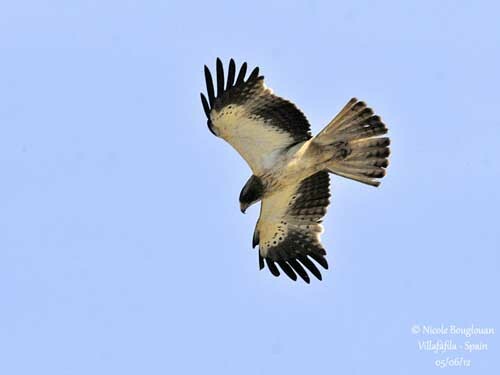 This visitor is migratory, coming from its wintering ground in Africa. 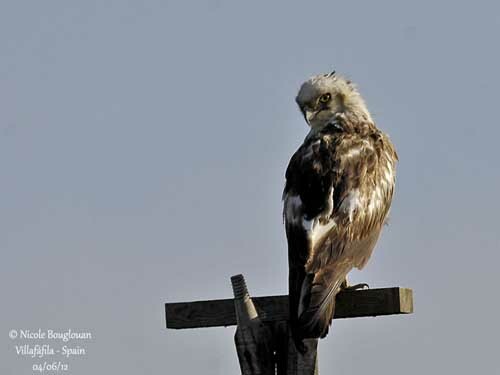 This one is a pale morph with black and white plumage. 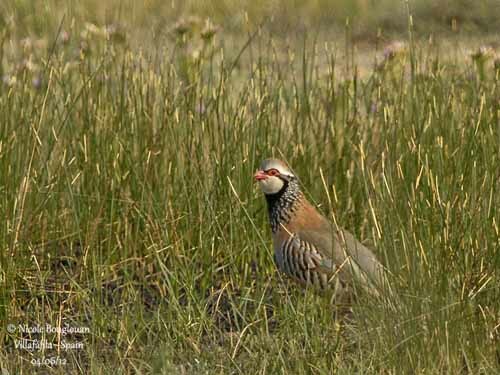 Its diet includes several items such as reptiles, lizards, insects, birds and small mammals, but young rabbits and Red-legged Partridges are its preferred food. 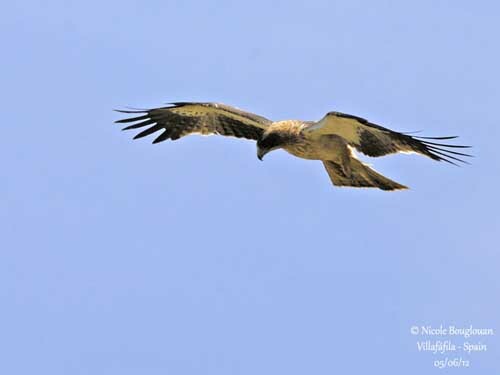 It hunts while flying and diving, or by low flight before to dive down onto the prey, and may also wait from perch. 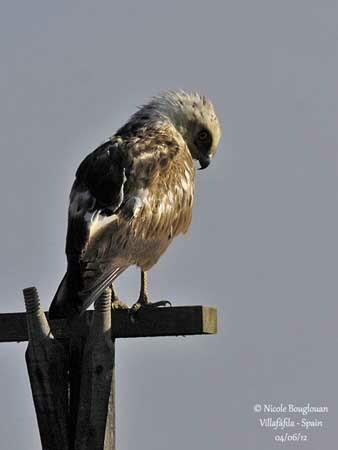 Our eagle is perched on a pylon, watching for prey on the ground. 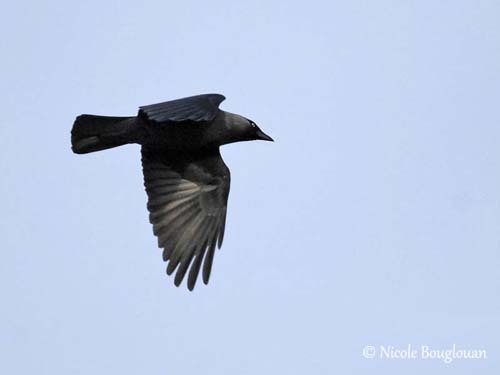 But suddenly, it takes off, flying low from the roofs and above our heads, showing the contrasted underparts. 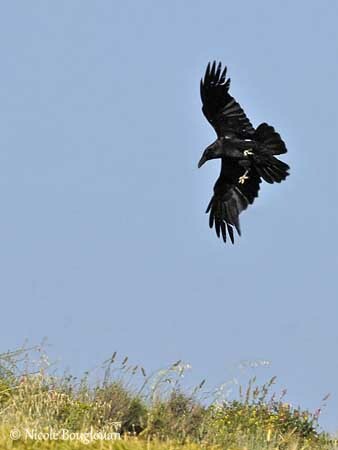 Then, it disappears behind the ruined walls of the church, flying over the fields. 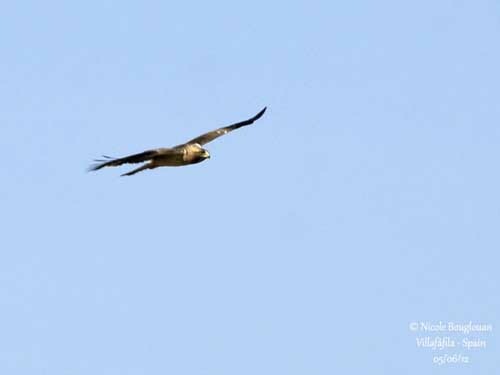 For this reason, the Short-toed Snake-Eagle (Circaetus gallicus) which is a summer visitor, finds its main food on these grounds. This raptor is known for eating two / three snakes per day! It performs some flycatching before to drop down onto the prey from 20-30 metres high. But it may hunt by walking, catching the snake on the nape for killing it. Its legs are covered with “scales” in order to protect the bird against the venom. It frequents dry, sandy and rocky areas, but it may breed in more humid plains. 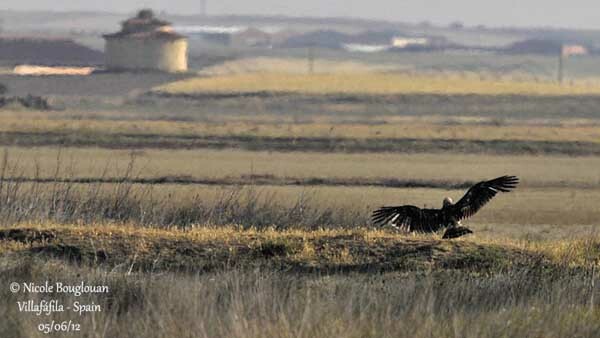 Highly migratory, it spends the winter in Africa, south of the Sahara. This is a wonderful flier, with large, powerful wings. Here is a juvenile, with large white patches and some down on the crown. 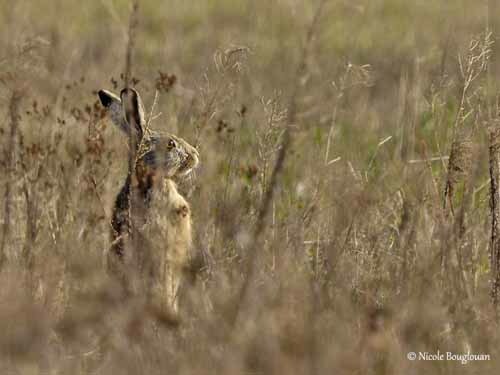 But let we return to the abandoned village where several species are living because we wish to see them. A pair of White Storks (Ciconia ciconia) is nesting on the old church tower. 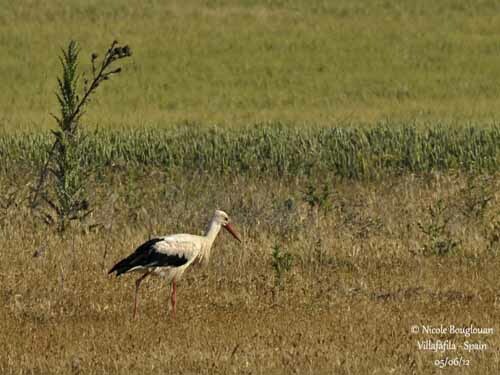 We can see both adults foraging in the close fields with other storks. Each village shelters at least one pair, but there are often two or three nests on monuments. 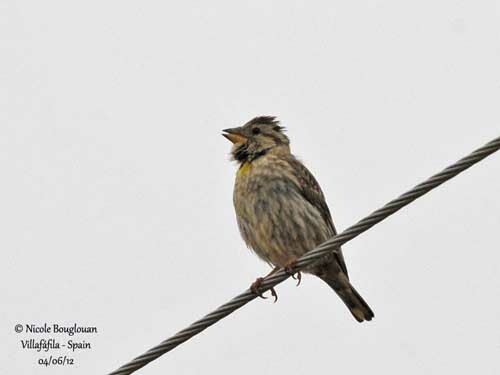 Inside the village, the Rock Sparrows (Petronia petronia) are nesting too, probably in some hole in ruined wall. This one was singing loudly just above my head! 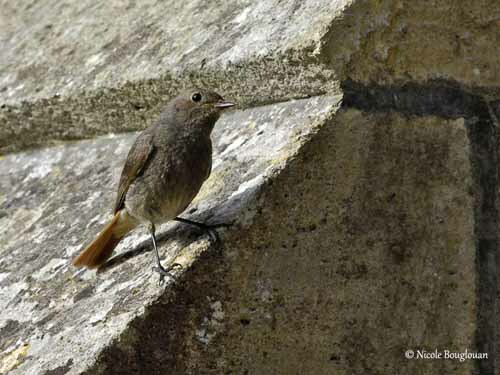 The Black Redstart (Phoenicurus ochruros) is a true cavity nester. A female is coming towards us, indicating her territory. She has her young at nest and she protects them. 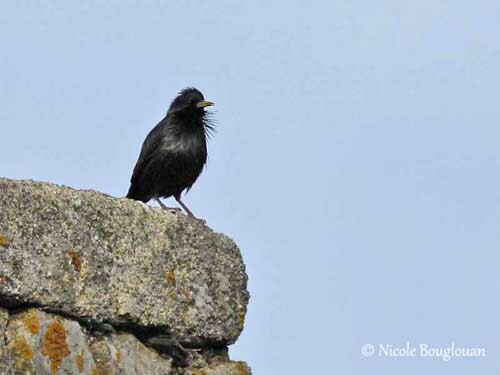 The Common Raven (Corvus corax), the Eurasian Jackdaw (Coloeus monedula) and the Spotted Starling (Sturnus unicolor) occupy larger cavities for nesting, but prefer to go away, reaching some perches around the village. 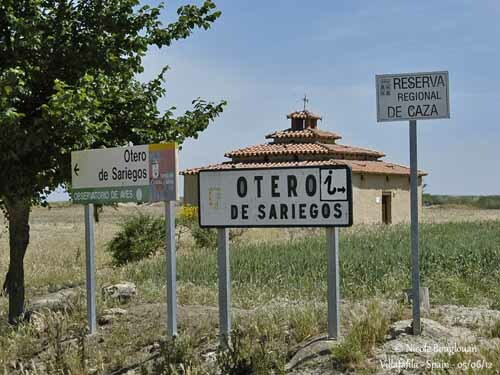 Finally, we leave this strange place of which ruins are testimonies of the past of this region. 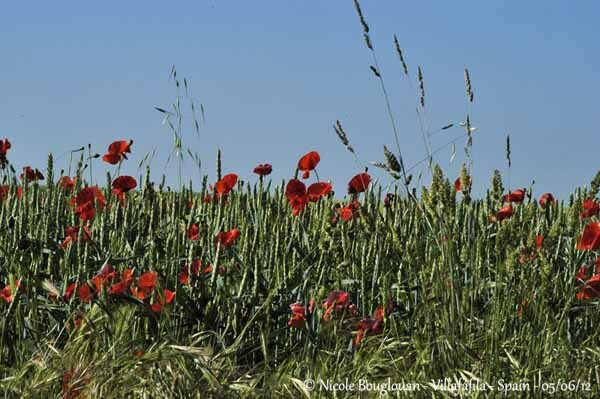 The open fields are red-coloured, due to the poppies. Several other birds are expecting our visit. Let us go and meet them!